Jain Temples in India are famous not only for their religious significance but also for their archeological and historical importance. To know more about Indian Jain temples, read the following. Jainism originated in India and is probably one of the oldest religions. At present, there are more than 12 million followers across the globe. The essence of Jainism and its method of preaching are very different from other religions, which can be observed in the Jain temples. In this religion, living a simple and peaceful life is expected. The 24 Tirthankaras of the Jains believed in following the right path by means of a right conduct and a right behavior. The shrines of the Jains portray the art and culture of this religion along with the teachings of Lord Mahavira and the others. The temples are intricately carved with beautiful structural designs. The most important aspect of a Jain temple is the Namokar Mantra engraved on a marble piece located in the main prayer hall. White marble is said to denote peace and tranquility. There are huge pillars embellished with complex carvings such as the life cycle of the Tirthankaras, branches and floral motifs. Read on to learn more. During the time of Mohammad Ghori, several temples were demolished and the remains were used to build mosques. Hence, to preserve the temples, a huge wall was built around these structures. Along with other structural designs, the doctrine of 'Ahimsa', which every Jain must follow, is also depicted on the walls of the temples. Some of the shrines have been directly carved into the cliffs. Along with this, there are groups of temples which form large temple cities at the peak of the mountains. For example, Shikharji or Sammet Sikhar, located at a height of 4,481ft, is where 20 Tirthankaras attained 'nirvana'. The idols of the Tirthankaras are made of marble or metal. Most of them are seated in a 'padmasana' posture with closed eyes. There is huge 'stambha' or pillar at the entrance gate with these idols facing four different directions. This is meant to signify that God is universal. The Digambers are known to use raw rice, coconut, cloves and coated almonds in times of worship whereas the Shwetambers also offer fruit and adorn the idols with ornaments. In the temple, a bowl is usually placed on a marble slab in which the holy water made of saffron and sandalwood is kept, known as 'Gandodhak'. It is the holy water with which the Tirthankars are bathed. Men are allowed to touch the idols whereas women are not granted permission. Some of the most beautiful Jain temples with white marble works and carvings of gold are the Ranakpur Temple (Rajasthan), Dilwara Temples on Mount Abu (Rajasthan), Shikarji and the Digamber Jain Bada Mandir (Hastinapur in Meerut). Sanghiji, the ancient Digamber Jain Temple in Sanganer, Jaipur is made up of red stone with impressive carved images. Padampura located at a distance of 35km from Jaipur is famous for miracles and hence, also called Atishya Kshetra. 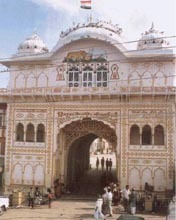 Sri Chintamani Jain temple (Bagol, Jaipur) is also known as the Golden temple of Bagol. Kundalpur (Sidha Kshetra) in Damoh district of Madhya Pradesh has 63 temples and is famous for the attractive idol of Lord Adinath. Moodabidri located in Dakshina Kannada district of Karnataka is popularly called the 'thousand pillars' temple. 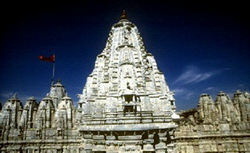 Ranakpur temple lies in the Ranakpur Village of Pali district in Rajasthan. The temple was named after the renowned ruler of Mewar, Rana Kumbha. This temple is world famous for being one of the five most important Jain shrines in India. Ade entirely of light colored marble, this temple instills awe with its engraved designs and grandeur.